It’s time for another Ingredient Spotlight! This week, Tiffany and I are featuring Chocolate! Hopefully if you haven’t already found some delicious ideas for Valentine’s Day, you’ll be able to find a few great recipes here. Oatmeal Dark Chocolate Caramelitas – These are downright amazing. Frog Prince’s favorite dessert, hands down. Get the recipe here. Not a caramel fan – check out this oatmeal dark chocolate fudge bar instead. Get the recipe here. The Best Homemade Brownies – These brownies fudgy and gooey, but what I love about them, they get that crunchy top layer so characteristic of “really good” box mixes. This recipe relies on chocolate chips rather than cocoa powder and we love it. Get the recipe here. Mint Chocolate Chip Ice Cream – Love this ice cream, even though it’s not green. Easy to make, and even easier to eat! Get the recipe here. Top it with hot fudge! Decadent Dark Chocolate Frosting – Put down the can and say hello to the easiest and best tasting chocolate frosting you’ve ever had. Trust me. Get the recipe here. Chocolate Chip Zucchini Cake (or Cupcakes) – This recipe comes from my grandmother and is a family favorite. No one will ever know you have them eating veggies for dessert – I promise. Get the recipe here. Now it’s your turn! Link up your recipes containing chocolate – you can link up as many recipes as you’d like, just link back to Finding Joy in My Kitchen. Thanks a million for hosting! Love love love this spotlight! YUUUMMY linkups already! 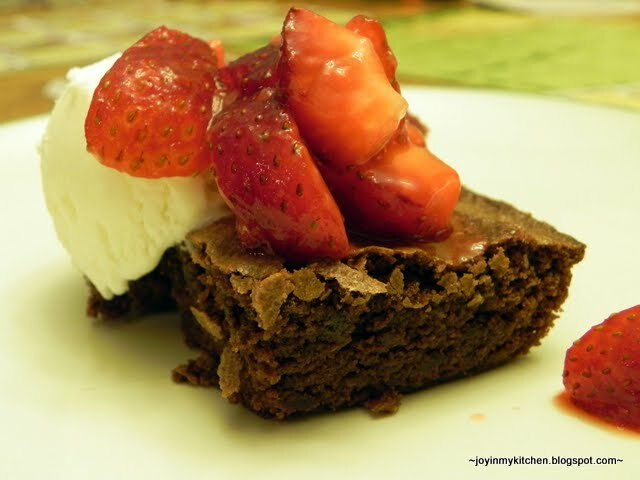 Nice surprise seeing you host this blog hop Sno :) I shared my Fudgy Cocoa Brownies, and Hot Chocolate Cookies. Thanks! I am a chocolate fanatic, so I have dozens of chocolate recipes on my blog! I settled on just a few :-) Can't wait to check out the others!